ICN Australia has several Major Divisions, which in turn may be broken down into several classes. Please note that division names and guidelines may differ in countries outside Australia. Promoters in their soul discretion select which divisions and sub-divisions they schedule for their respective events. * Divisions/Classes are not offered at every show – please check the entry form for the event you are entering. First Timer First Timer means you have never competed before in any federation. First Timer means this is your first time on stage. It does not mean this is your first time in the division. You can only compete as a ‘First Timer’ once. Novice Novice is your first year of competing in a specific division. This means enter your first contest between January 1 and June 30 your Novice status continues until December 31. (Novice for Season A and B). Enter your first contest between July 1 and December 31 your Novice status continues until June 30 the following year. (Novice for Season B and A). Momma You must have had children, we may split the division by time since birth of last child, as in less than 2 years, 2-5 year’s, 5+ year’s at the discretion of the promoter. Age There can be many different age classes set by the promoters, an example is 30Plus: 30 years & over on day of contest. Height There can be many different height classes set by the promoters, an example is Class 1: (Under 157.5cm). Bikini Model A softer, beach-body compared to the Fitness Model Class. Competitors should not have a 6 pack abs. Judged just in bikini. Fitness Model Aim to have 6 pack abs. Figure International Judging based on the Symmetry round only. Emphasis is on balance and stage presentation. Figure Judged along the lines of bodybuilding but figure competitors should have less bulk. Bodybuilding Competitors should have the most bulk and muscularity of any of the female divisions, be well defined and toned. 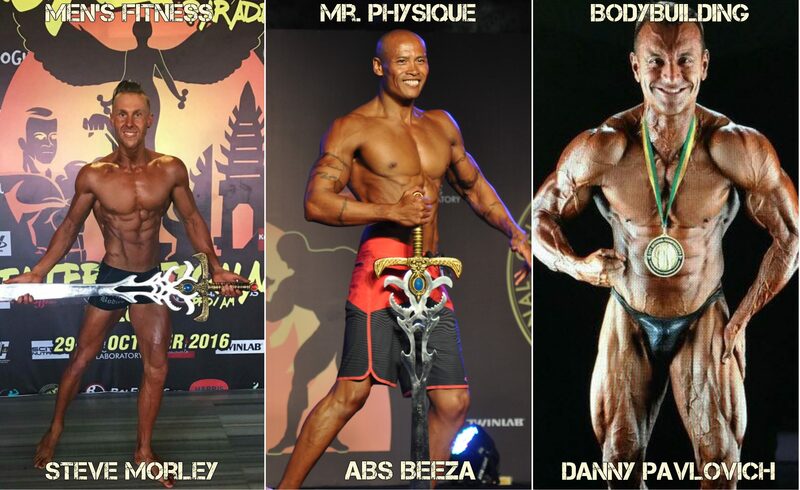 Men’s Fitness Male fitness models have the same ideals as their female counterparts – to present themselves professionally on stage as a model. Physique Judges look for fit and athletic contestants who display the proper shape and symmetry combined with muscularity and overall condition. Bodybuilding Competitors should have the most bulk and muscularity of any of the male divisions, be well defined and toned.